If you suspect you've come into contact with bedbugs while traveling, the important thing is not to let them hitch a ride with you on your clothes or luggage to the next place you stay. The University of Minnesota has a short guide to show you what bedbugs look like, and how to inspect and sanitize your belongings. In brief summary, you'll want to have plastic bags (preferably the thick contractor kind) and access to a clothes dryer. If you've discovered an infestation in your home, or you've found out that a neighbor has bedbugs, the most important thing is to get informed. A great place to start is the Bedbugger.com FAQs. Bedbugger.com also has a good list of do's and don'ts. While the temptation to do something, anything, to address the problem immediately is strong, you could end up inadvertently making things worse for yourself and your neighbors. So have patience and read those FAQs! The key to avoiding a bedbug infestation is to learn as much as you can about them before your paths cross. Find out what bedbugs look like. Adults are easily visible (dark brown and about the size of a tick), but the nymphs are translucent and quite small. Bed bugs in all stages of life are extremely flat, so they can hide in surprising places. Remember that bed bugs don't care about cleanliness! They can thrive in an immaculate, five-star hotel room just as easily as somewhere run-down. All they need is proximity to people and a crevice to hide in. Learn how to check a hotel room for signs of bed bugs. You should know how to examine a mattress and how to examine a headboard, the most common hiding places for the bugs. Store your luggage on a metal rack or luggage stand away from walls and furniture. This will greatly reduce the risk of bringing home an unwelcome visitor . If you are very worried about bringing bed bugs home, consider bringing along a product like the packtite, a portable heating unit for luggage. Pack light, and bring things that you can put through the dryer before returning home. A few minutes at high heat will be enough to kill bed bugs and their eggs without damaging most clothing. But you must ensure everything is heated all the way through. Reduce clutter. The fewer places bedbugs have to hide, the better your chances of catching an infestation before it can get established. Check the registry, and talk to your neighbors! Bedbugs can spread easily within a building, so it's important to know if you are at elevated risk. 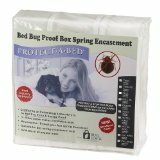 Take steps to make your sleeping quarters inhospitable to bedbugs. This can include buying mattress encasements, using a steel bed frame, and caulking all cracks and crevices to reduce hiding places. Bedbugger.com is the best all-around website on the growing bedbug crisis. Be sure to read their extensive FAQs. Managing bed bugs, by the university of Nebraska. Useful photos of nymphs. A handy bedbug fact sheet from Michael Potter at the University of Kentucky. The packtite destroys bedbugs and eggs in luggage through heating. Mattress encasements create a physical barrier between you and bugs living in your bed. A HEPA vacuum can help reduce bedbug populations. Contractor plastic bags are unglamorous but essential in making sure debugged stuff stays that way. A steam cleaner will kill bedbugs and eggs in areas where it is directly applied. Bedbug traps are a useful way to monitor your progress against an infestation.